The next part of learning Autocad online is understanding how the Ucs (User Co-ordinate System) affects 3D modeling. Using the UCS is a vital but easy part of our course to learn Autocad free. Drawing some shapes on the faces of the box will demonstrate this. 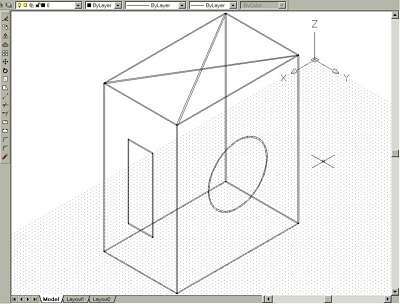 Older Autocad software does not require the 'n' modifier - move straight to the 'x' modifier on the next line. The diagonal construction line can be removed using 'erase'. Erase it and then save your work before starting the next task.